The Nintendo Switch Online is off to an extremely fine start. The online service that allows Switch owners to play online has surpassed 8 million subscribers. Even with the Nintendo Switch selling over 32 million units, at least a quarter of its user base is using the Nintendo Switch Online service. Nintendo President Shuntaro Furukawa, has said during the Financial Results meeting that Nintendo plans to expand on the service’s offerings with “More Games, More Features, More Fun”. In last September, we launched Nintendo Switch Online, a paid service that expands the online functionality of Nintendo Switch. 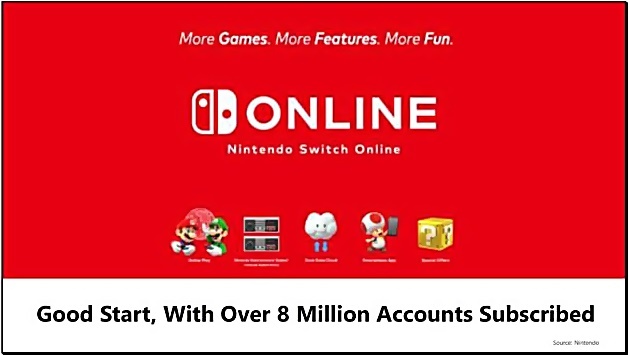 Nintendo Switch Online has had a good start, with the number of subscribers surpassing 8 million accounts not including free trials. In keeping with our goal of providing Nintendo Switch owners with “More Games. More Features. More Fun,” we are working on continuing to expand the service offerings.